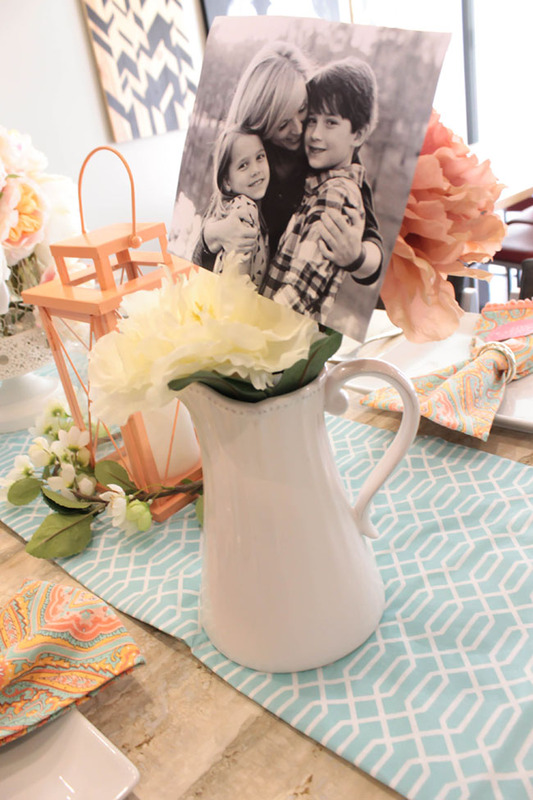 Lovely Blooming Mother’s Day Table! Mother’s Day week continues and today we have a lovely blooming Mother’s Day table that we know you are going to swoon over! Spring is here and that means Mother’s Day is right around the corner! 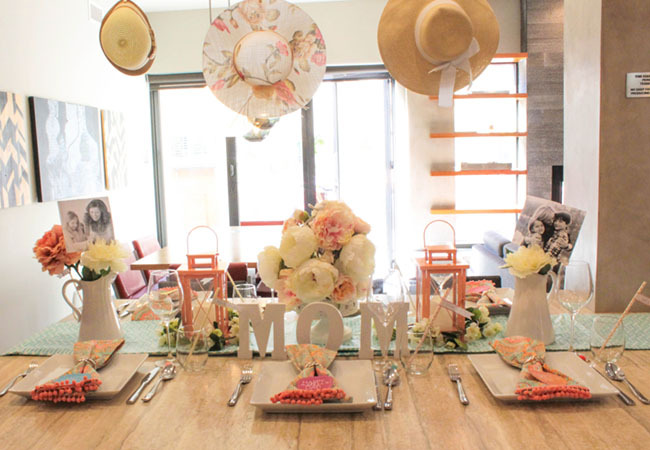 Today we are going to show you a perfect table setting you can put together for all of the lovely Moms in your life. 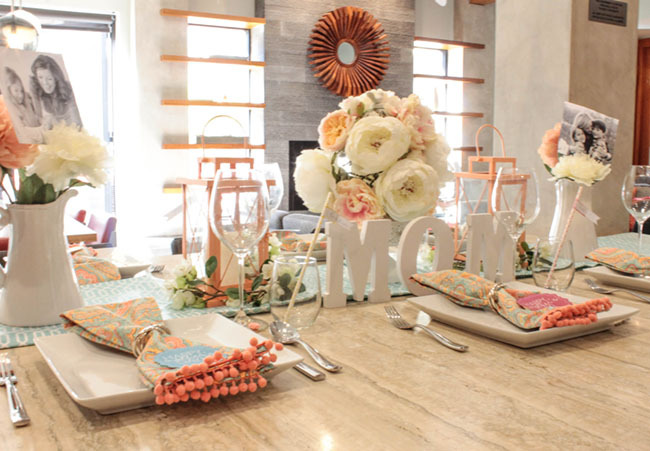 Mother’s Day is all about florals and touching details and this tablescape is full of both! 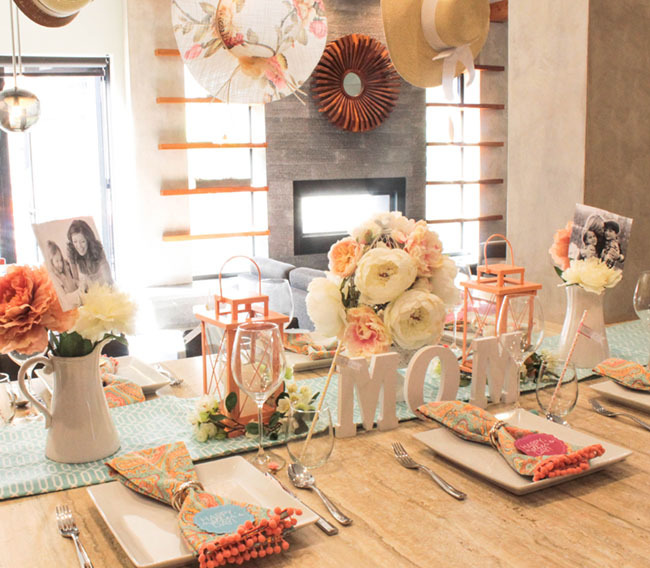 With the help of Jo-Ann Fabric and Craft Stores Bloom Room, they have all the flowers you need to put together this fabulous table plus their new In The Garden Line has some dreamy décor that really brings this table and look together! 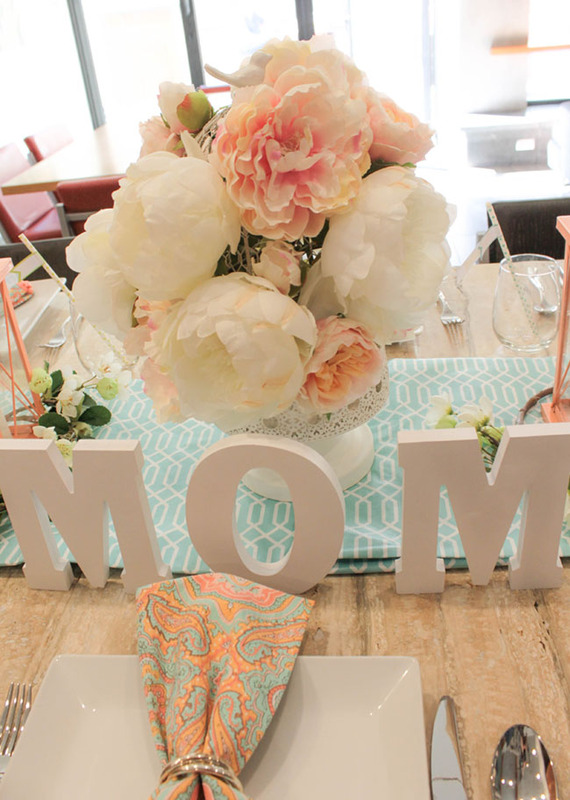 Can’t wait for you to see this dreaming Mother’s Day Table! 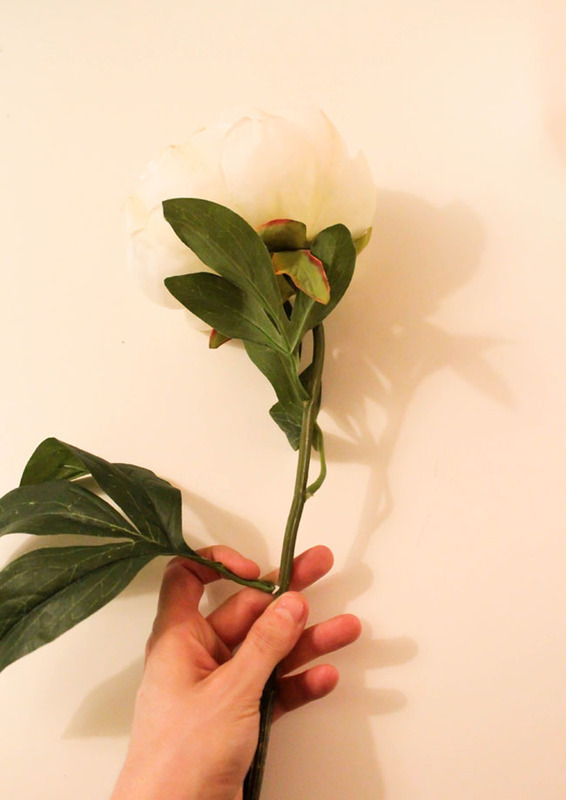 We love peonies, LOVE them, and when they are so big and blooming in spring they are a perfect bloom for a soft, romantic look which is a perfect theme for Mother’s Day. We went with soft colors like peach, white and soft blue with lots of lovely personal touches. 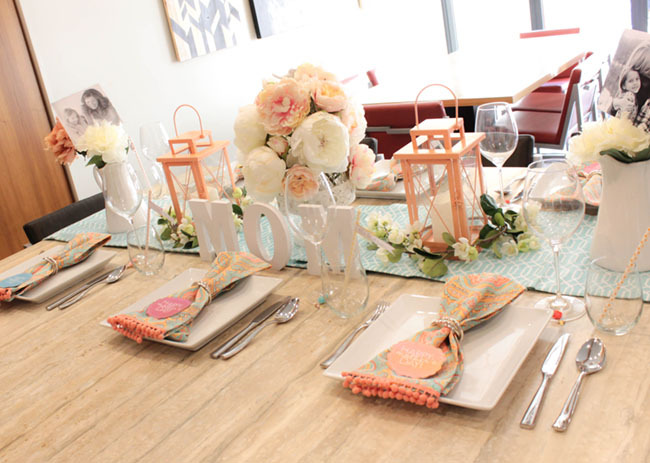 Don’t you just love those amazing coral peach lanterns and the blue geometric modern patterned tablecloth. Jo-Ann also has these amazing blue and coral hand towels with fun coral pom poms on them that add an elegant yet whimsical detail on the table. They are amazingly cute! We also added a cute Happy Mother’s Day tag to each napkin that is a free printable you can download from Kiki Creates. She has a whole set for you to download that includes tags and straw flags and a wonderful Mother’s Day sign too! 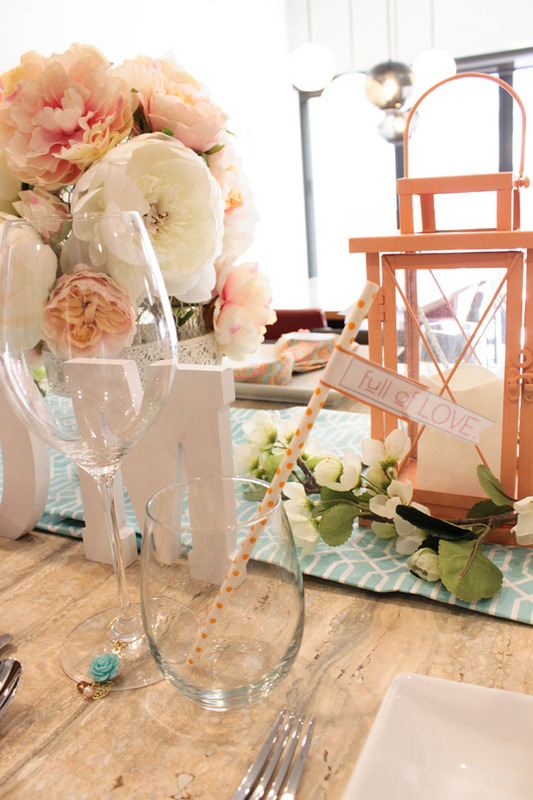 We thought they were so cute on the straws for this Mother’s Day Tablescape. Notice the cute little rose wine charm on the wine glasses? 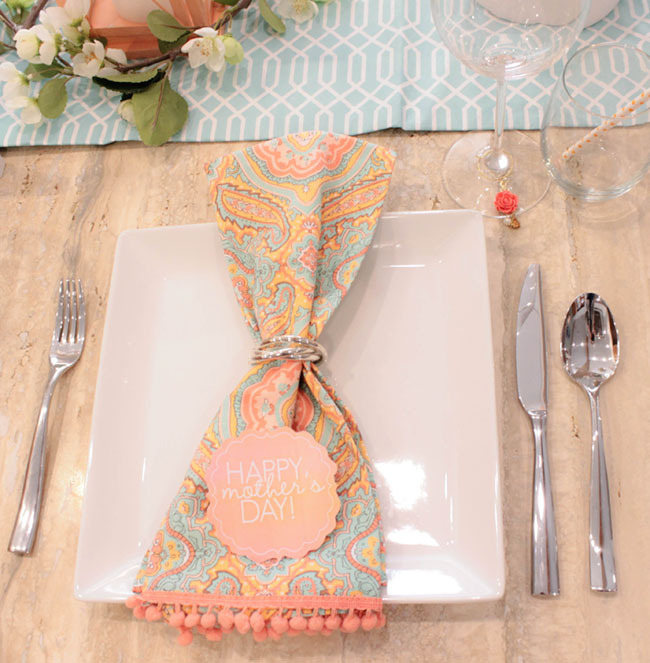 You can get those from Jo-Ann too and they match the blue and coral colors of this table setting perfectly! 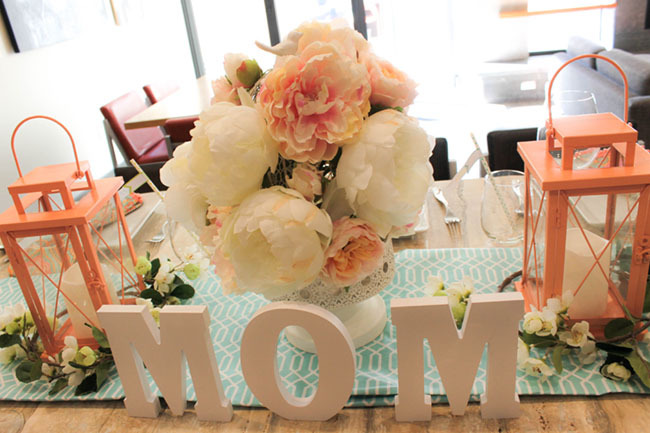 Add in a cute “Mom” wood sign to your table to really bring out the Mother’s Day theme on your tablescape. We picked up these white wooden letters from Jo-Ann because they are of the cute self -standing letters that they have to choose from and their soft edges goes seamlessly with the soft romantic feel of the table. 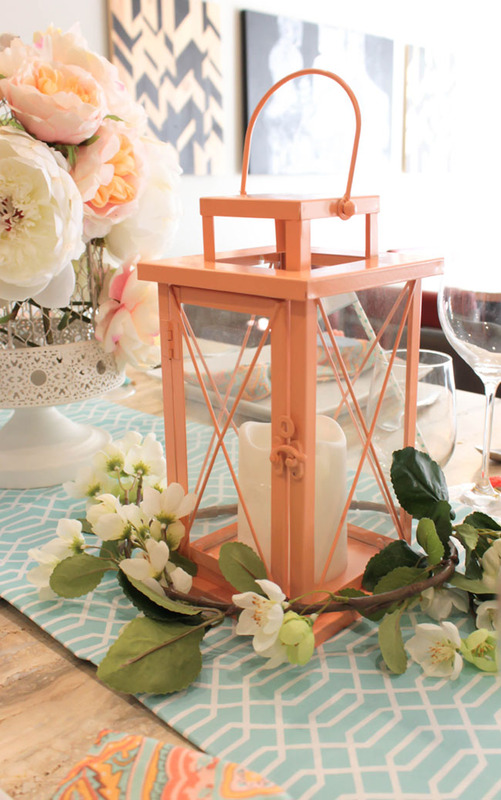 We wrapped a single blossoming tree branch around the lanterns to add even more floral to the table. Simply use a glue gun and some glue to attach the ends and it makes a perfect circle the lantern can fit right into. Add in some black and white personal and touching photos to bring back happy and affectionate memories for Mom to enjoy on her special day. 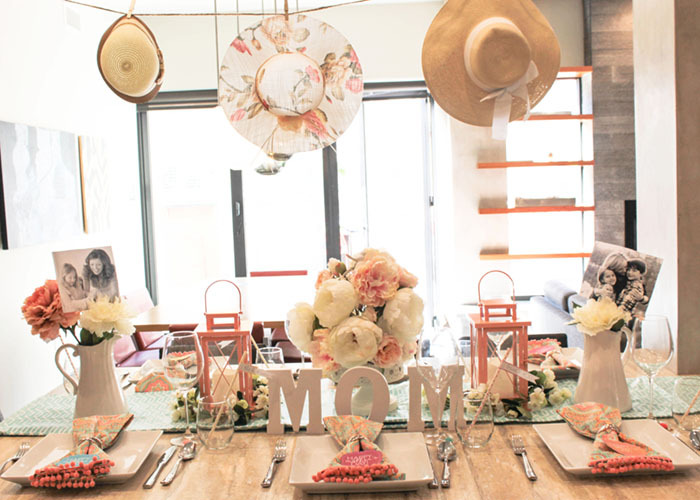 For an lovely added detail, we suspended some lovely gardening hats that we found throughout the store to add in another touching Mom element to the table. Hang the hats that she wears the most or pick from some that Jo-Ann has. 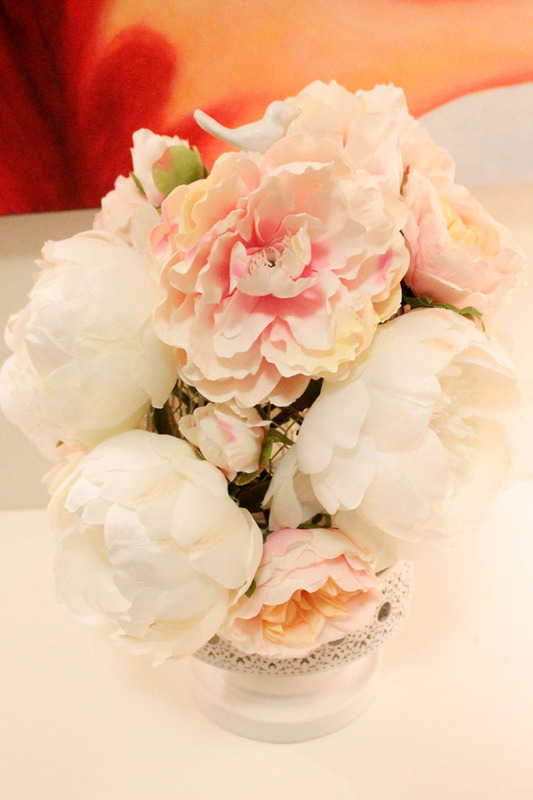 We adore this floral one we spotted in Jo-Ann with peonies on it that matched the theme flawlessly. 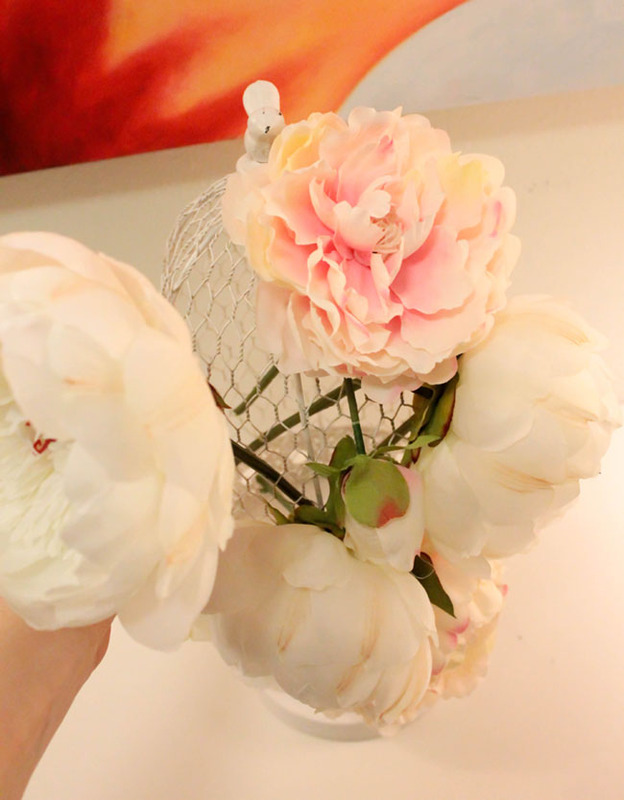 We absolutely adore this DIY peony birdcage centerpiece for this Mother’s Day table. With just a few simple steps you can make your own at home today. 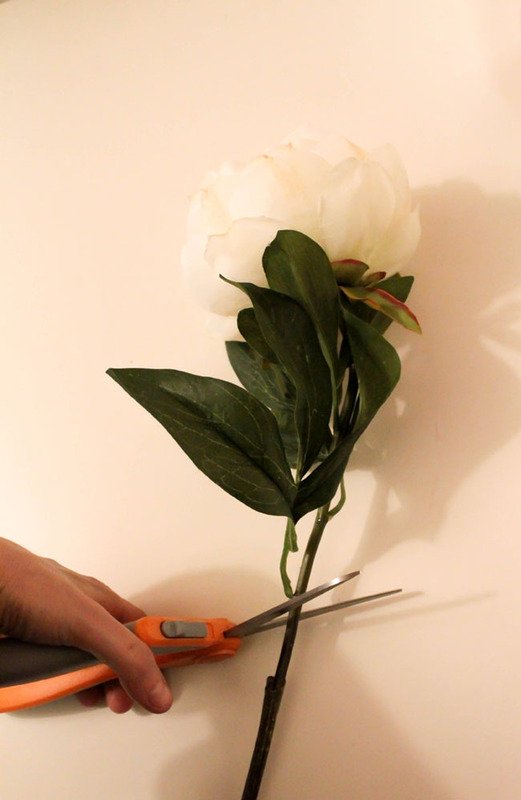 1) Cut the bloom to a short length, about 6 inches or less. 3) Place them in the holes of the chicken wire birdcage. No set pattern here, just what you think looks best. The holes in the wire will hold the blooms in place so you don’t need to secure them. 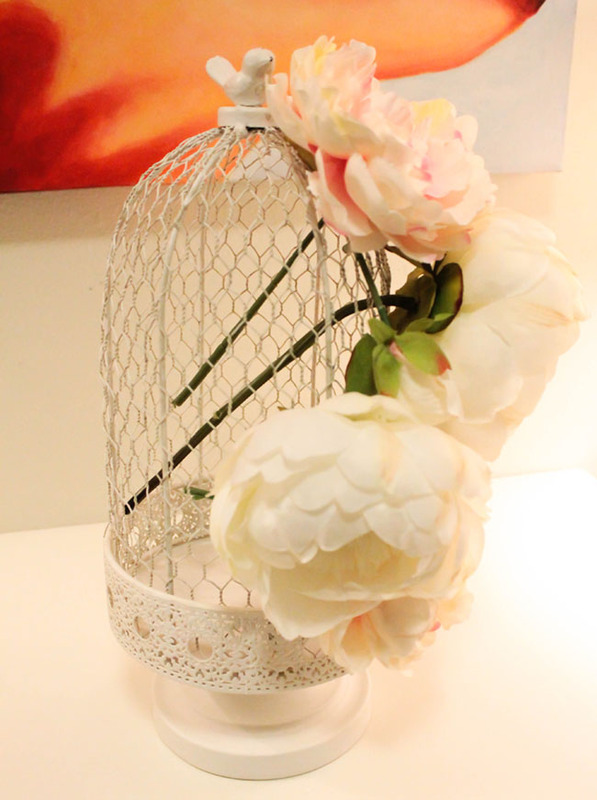 4) Place all the blooms around the birdcage until you get a completed look. Leave some room for the birdcage to been seen will add some nice dimension to this birdcage centerpiece. Ta-da! 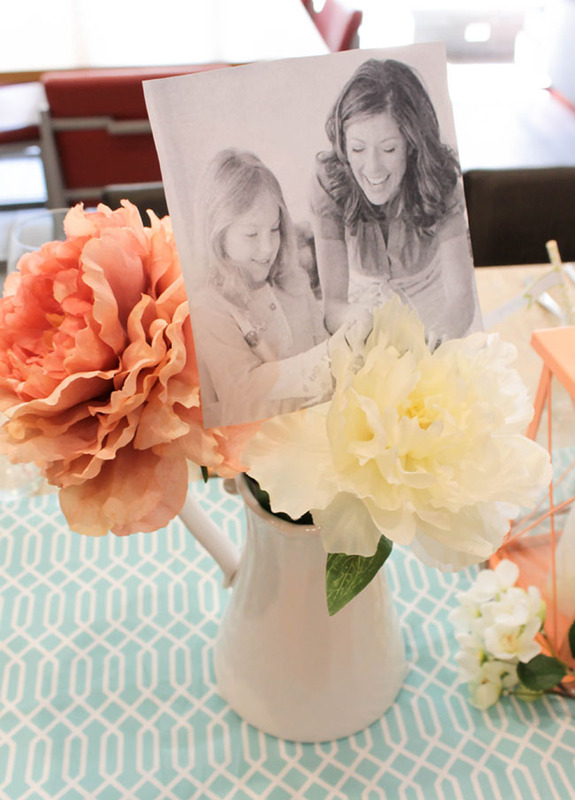 A Lovely Mother’s Day Centerpiece! It’s so beautiful on this Mother’s Day table and when you mix in a few lovely lanterns and some ceramic pitchers, you really get lovely look!